SistemHost Review 2019: Is SistemHost a Good Hosting? 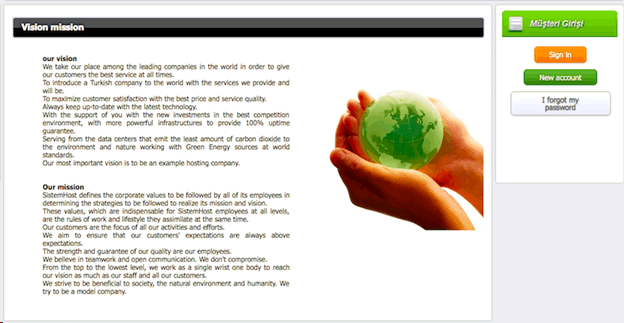 SistemHost is a Turkish-based website hosting provider. It offers a selection of Windows and Linux hosting plans, served by its own data center. SistemHost is a Turkish-based hosting provider founded in 1998. It owns its own data center and is now one of the leading Turkish hosting providers. Its website is available in Turkish only. In 2004, SistemHost launched its own data center in Turkey, which has 2 Gbit of fiber optic backbone connection with redundancy to Türk Telekom, one of the Turkish networks, with over 90% more redundancy and accessibility than other infrastructure providers. I always like it when a host owns its own data center; it means that it can be faster to resolve problems and it’s much less likely it is reselling bandwidth, which means faster website load speeds for you! It would be nice if the uptime was indicated, however. All plans come with one free domain registration, unlimited website applications, and FTP access. Most of the other resources, e.g., subdomains, email accounts, user accounts, and MySQL databases increase according to the size of the plan. All plans come with support for PHP version 5.3, and common programming languages asp, asp.net, or php, however, there is no support for Perl, CGI, Ruby, Python, etc. Perl and CGI are supported by the virtual private servers. All plans come with an English Plesk control panel. Beginners may be disappointed not to find a one-click installer or website building tool in any of the packages. In terms of pricing, there is a vast range, so there’s a plan to suit most budgets. The Economy plans are unsurprisingly, cheap, and if 500MB disk space and 5GB data are enough resources, you might just grab a bargain. Just be sure to consider that domain registration and SSL certificates are available at an additional cost. Plans are available on annual terms and payment is a little unusual. Once you’ve chosen a plan, you need to create an account online and then send a bank transfer. Perhaps a little old school, but the system seems to work for SistemHost. There is a 30-day money-back guarantee, although you have to dig into the terms and conditions to find it. Customer support is via email, telephone, and live chat, and there is a U.S. based office, as well as Turkish staff. It does state that they can be contacted “at any time of the day” however I have been on the live chat that indicated it was online, and received no immediate anwer. There is also a client-only area which requires login, and a limited FAQ section. SistemHost has grown since 1998. Originally a Turkish based company, by 2004 it owned its own data center and by 2009, it had expanded to include a U.S. branch of the business. Check out SistemHost’s web hosting options today! Wondering how SistemHost stacks up against other Web Hosting companies? Enter any other Web Hosting company and we will give you a side-by-side comparison.